I stumbled across Aleyard Brewery beers following a visit to Snape Maltings over the Mother’s Day weekend. I was delighted to discover a new East Anglian brewery brewing a wide range of beer. On their website, an incredible 22 beers are currently listed. I encountered their beers again the following weekend at Russell and Newnes in Aldeburgh. I soon got in touch with my good friend Karl to organise an evening to consume the bottles I had amassed. Anyway, here are the beers we tried in order of tasting. AA Bitter 3.5% – Very sweet bitter with a medium body. Not bad. Ellie Elderflower Golden Ale 3.8% – A crisp golden beer with a fairly dominant Elderflower aroma and flavour. Was very refreshing. Kels Ale 4.6% – Very similar to the AA Bitter but with a hint more bitterness. Krystal 4% – Again, a sweet, malty copper coloured beer. Was our least favourite at this stage. 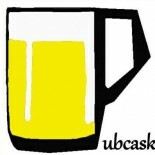 Cascade 4.3% – This was one of our favourites. Light, zingy and refreshing; this beer really showed off the Cascade hop. Harald 4.8% – This dark best bitter was very sweet and had a pronounced malty flavour. We enjoyed this but rather contentiously we felt that it had more in common with a mild than a best bitter. Dawn 6.5% – This ‘Anglian Pale Ale’ was one of our other favourites. A lovely balance with initial sweetness followed by a bitter finish making this very drinkable. Stout 5.7% – This was a fantastic stout. It was silky and full bodied with a classic roasted character. Excellent. Dusk Old-style strong ale 7% – We found this again quite sweet but the finish was rather harsh. We weren’t fans. Beer O’Clock 8.5% – This ultra candy sweet strong beer was okay. Me and Karl were split on this one as I enjoyed it whereas he really didn’t! It didn’t quite have enough about it to call it anymore than satisfactory. The four pictured above were our favourite beers. The beers above (particularly the stout) were good beers by any standard. The others were distinctly average and had a tendency towards the sweet side. Aleyard Brewery are a brewery to keep a very close eye on. Graeme is a passionate brewer whose dynamic portfolio of beer shows that with time Aleyard could make some serious noise within East Anglia. This entry was posted on May 4, 2016 by Chris Stone in Beer Shops, Beers, Breweries and tagged Beer, Beer Shops, Beers, Bottled Beer, bottled beers, Craft Beer, Real Ale, real ales.